Darling! You look simply ravishing in those Loeffler Randall™ Birdie. Textile upper with striped trim. Small heel with synthetic outsole. 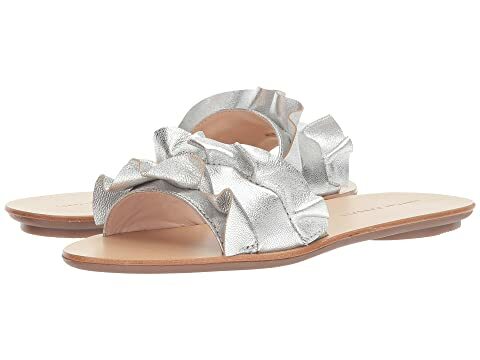 We can't currently find any similar items for the Birdie Ruffle Slide Sandal by Loeffler Randall. Sorry! Super cute and great for spring and summer. Size a half up because it runs a little narrow. I am a perfect size 9 and ordered a 9.5. Fits perfect! Overall: Rated: 4 stars! Comfort: Rated:3 stars! Style: Rated:5 stars! The slide is absolutely adorable, but not quite the quality I would have expected for the price. The suede didn't look high quality in person. The only reason I sent it back was the fit. As other reviewers mention, it is narrow, REALLY narrow. As always, Zappos was amazing with their customer support. Overall: Rated: 3 stars! Comfort: Rated:5 stars! Style: Rated:5 stars!